'scuse me while I sit a spell - Stop staring and start sewing! I want to give a huge thank you for all the crazy shopping since my last post (like in the beer commercial, I love you man)! I've been on my feet since Friday just cutting and shipping fabric (the swelling in my cankles is finally subsiding) and I'm so happy it's all going to good homes. I was actually able to relax a little today. I laid down on a sunny park bench while my 8 year old guy Asher played in the sand. No computer, no book (and my phone only rang once). Nice (vitamin D too!). A few months back Kristen of Gock's Frocks (I've been a fan forever!) asked for a little advice combining fabrics from my store and I was so thrilled because Kristen uses uncommon fabric combos and I knew she didn't want the typical matching colors and patterns. I didn't realize it was for flower girl dresses so when I finally saw the finished projects I almost cried! 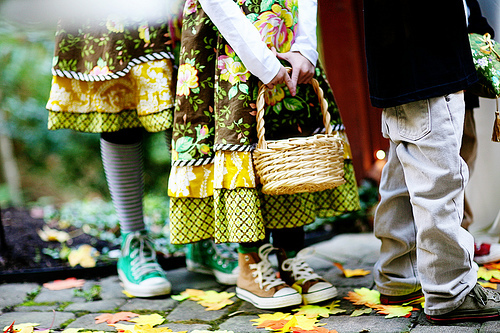 Why don't more people use more of these awesome "quilting" fabrics for flower girls???!! There are so many stunning girly prints out there and people just can't seem to get past white lace. Anyway, look at these (and tennies too!! Seriously people!). Here's a view of the big girls dress (that's the Feliz dress pattern from Farbenmix). Can you believe how gorgeous that is?! Kristen has a beautiful gift for design. Oh, and she might have a gift for you! Run over to her blog and say hi because I happen to know she's having a give-away (and you seriously do not want to miss out). Joey and I recently joined the Barnes and Noble book club since they're so close to us now and I've used that little discount to indulge in a couple of goodies recently. I got the fabulous Weekend Sewing book (by the fabulous Heather Ross) that everybody has been raving about and I just can't wait to try the Summer Blouse pattern. It looks perfect for Arizona, lightweight but good cover from the sun. My girls and I are going to get a lot of use out of this book (patterns are included) this summer! 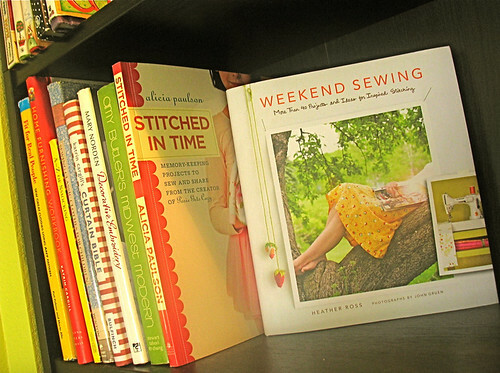 Then a couple of days ago I picked up Alicia Paulson's book Stitched in Time and what a treat it is!! The picture are gorgeous, the projects are easy but amazing (she even includes instructions for the beautiful Nutcracker Doll on the cover). If you've read Alicia's blog (and seriously, who hasn't?) you might remember the sad day she posted that her beloved corgi Audrey had died. I think there was a collective sobbing in the craft blog world that week. Well I opened this beautiful book in the bookstore and when I saw that she had dedicated it to Audrey I started crying again (I was in a corner so it was okay). This one may go on my coffee table. It's more than just a pretty book. Here is a peek at just one of the projects. A sleepover pillowcase. It's just a simple pillowcase (instructions are in there) but look at that rick rack phone number. Give me a break! That is so brilliant!! The whole book is like this. In other seriously creative news, Bari J. has a post on the strike-offs from her first fabric line, Full Bloom. Run over to the Windham site to get a look at all of the prints. I've order the whole line and it should be out in May. And I was so happy to open an account with Windham that I ordered the whole Fiona line by Anna Griffin (here tomorrow!) too. I love her designs and I have a few classics in my stash that I just can't part with because they are so incredibly soft (I bought them just so I could touch them and don't think I'm weird because I know you do it too!). I'm hoping she'll be at Spring Quilt Market in May so I can chat with her. She was in Houston for the Fall Market but I didn't want to go up and say "Hi! I'm Jona! I'm a huge fan but I don't carry your fabric in my store." Tacky. So I'm good to go now! 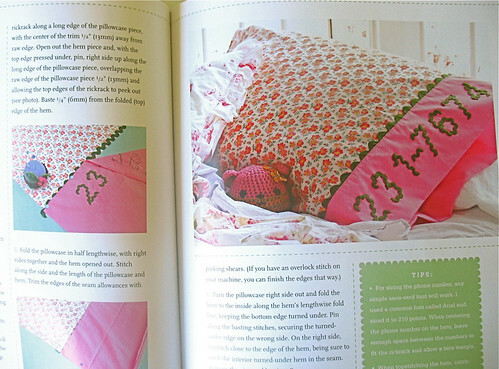 Also coming soon are patterns by Anna Maria Horner (yippy!) and Patty Young (you're going to love these!). Any day now! Oh and I grabbed some great Easter egg colored laces at SAS (I still don't know what it stands for so I've dubbed it "Seriously Awesome Stuff"). I paid by the pound (you can see I went overboard) so they are dirt cheap in my store and shipping is included in the dirt cheap price. 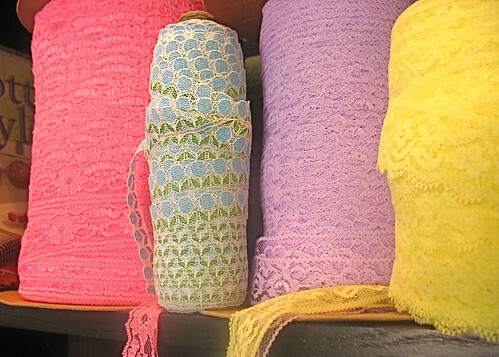 Great for Easter projects! Have you heard of Pandora Radio? It's one of my favorite new things out there (or maybe it's not new and I'm just incredibly un-hip and just found something everybody already knows about)! You type in the name of a favorite song or artist (I typed Andy Gibb, yes I did) and it creates a custom station for you with songs or artists of the same genre (Bee Gees, Yvonne Elliman, Chicago, and more). My favorite stations that I've made are Go-Gos Radio (which includes artists like Joan Jett, the B-52's, and Cyndi Lauper) and Carpenters Radio (Bread, England Dan & John Ford Coley, Carole King). It's really fun unless your kids get a hold of it and create an Enya station (seriously depressing). Teenagers these days! I hope you're having a wonderful week! Thank you all for being so much fun and so inspiring too! I love hearing what everyone is up to!